Boston – In support of fair and impartial courts, the Committee for Public Counsel Services, joined by the Massachusetts Bar Association, today released a statement about efforts by some who are calling to remove Judge Timothy Feeley because of a recent sentencing decision. “Our forefathers were careful in crafting both our nation’s tenets and in Article 29 of the Bill of Rights of the Massachusetts Constitution. If we begin to remove judges because we don’t like their decisions, then we begin to undermine our judicial system and the judicial impartiality that is so vital in maintaining a fair judiciary,” said Anthony J. Benedetti, chief counsel for the Committee for Public Counsel Services. “An independent judiciary is a cornerstone upon which this country was founded. Our citizens are entitled to no less than a free and independent judiciary bound by the rule of law and not the vagaries of public opinion and political consequence,” said Christopher P. Sullivan, president of the Massachusetts Bar Association. “Individual attacks and overly broad intrusions will have a chilling effect on the judiciary and will erode public confidence in the judicial system,” said Sullivan. This entry was posted in Chief Counsel's Office and tagged press release on May 23, 2018 by dsimonini. On Thursday, April 26, CPCS had the pleasure of honoring exceptional members of our community – attorneys from the public and private counsel divisions, as well as a social worker, investigator and administrative professional – who work tirelessly to insure that CPCS meets our mission: to fight for equal justice and human dignity by supporting our clients in achieving their legal and life goals; to zealously advocate for the rights of individuals; and to promote just public policy to protect the rights of all. 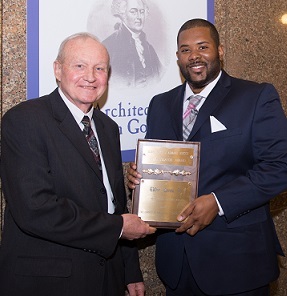 Gathered at the John Adams Courthouse were honorees, members of the staff and private bar, friends, family and clients of the honorees, as well as Committee members. The ceremony was a moment to pause and to celebrate the outstanding work of colleagues on behalf of their clients, not just over the course of the last year, but for their perseverance over the course of their careers. 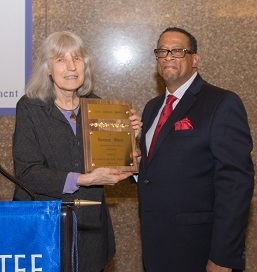 NANCY T. BENNETT, Thurgood Marshall Award. 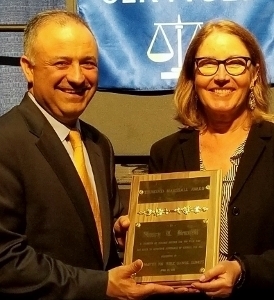 The Thurgood Marshall Award honors a person or persons who champion the cause of zealous representation for the poor, and the right to effective assistance of counsel for all. 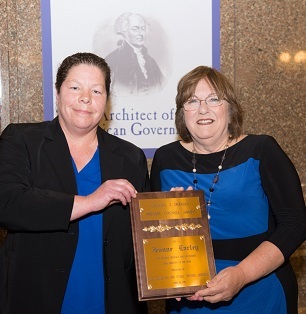 WENDY S. WAYNE, Carol Donovan Exceptional Advocacy Award. The Carol A. Donovan Award for Exceptional Advocacy is presented to the lawyer, public or private, whose representation of poor people facing the awesome power of the state is most reminiscent of Carol’s fierce commitment to their vigorous and effective representation, and the cause of equal justice for all. 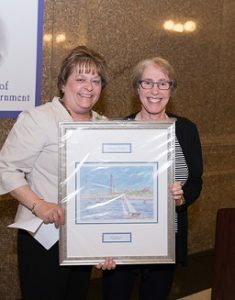 BONNIE E.MULLEN, Maura Mellen Administrative Professional Award. The Maura Mellen Administrative Professional Award honors an administrative staff member who has made an outstanding contribution to the delivery of zealous and effective advocacy for CPCS clients. The award recognizes that administrative staff members perform many critical roles in the provision of zealous representation to CPCS clients. 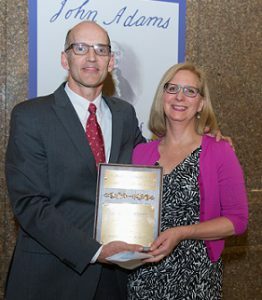 KAREN OWEN TALLEY, Paul J. Liacos Mental Health Advocacy Award. The Paul J. Liacos Mental Health Advocacy Award recognizes a public defender or private attorney whose legal advocacy on behalf of persons involved in civil and/or criminal mental health proceedings best exemplifies zealous advocacy in furtherance of all clients’ legal interests. ANN BALMELLI O’CONNOR, Margaret Winchester Child Welfare Advocacy Award. The Margaret Winchester Child Welfare Advocacy Award honors a staff member or a private attorney who, through his or her zealous advocacy and extraordinary commitment to children and parents in care and protection and other Massachusetts child welfare cases, is a model for other advocates seeking to protect the rights of children and parents. 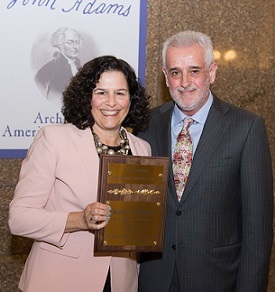 EDDIE COREN, JR., Maria Souto-Armand Goyette Investigator Award. 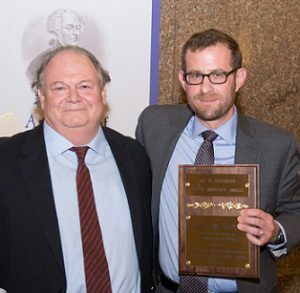 The Maria Souto-Armand Goyette Award honors a staff investigator for outstanding investigative work. 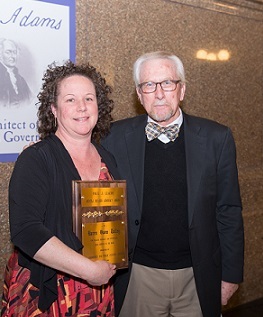 Maria Souto was an indefatigable CPCS investigator in the Boston office. 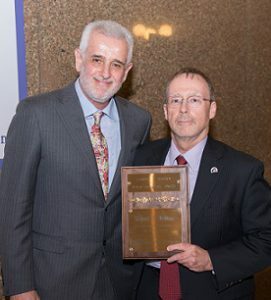 Armand Goyette, the first investigator at the Massachusetts Defenders Committee, was recognized as a consummate criminal defense investigator who provided outstanding service for over 25 years. This entry was posted in Private Counsel Division, Public Defender Division on May 4, 2018 by emooney.